The Eaglet is an allegorical tale of a baby eagle that wants to fly and does so against the warning of his father. The first part of the DVD is this story. The second explains the allegory in a way that children can understand while remaining theologically sound and being very evangelistic. Finally the third part is a recap boiled down into five truths you cannot forget. 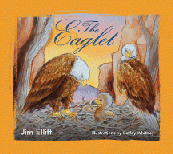 Jim Elliff‘s short tale is not only full of Biblical truths, it holds your suspense as you are anxious to see the eaglet repent. We know the repentance is coming, but the kids may not. The eaglet’s repentance paints a great picture for the children of what repentance looks like. In the second part, the evangelistic message is direct, as it should be. “You deserve to go to hell” is not a popular statement to make to a 2 year old, but it is true and it is what God says. I commend Elliff for this. Elliff kindly provided me with a review copy of this DVD. I am always thrilled to hear about children’s materials coming from ministries where theology is a priority — Elliff, his church, and CCW all take theology seriously. Jim informed me ahead of time that this was a book on DVD, not an animation. That warning left me a bit apprehensive, thinking it would not hold the attention of my two year old. I was wrong, the production of this video was very good. The video producers can hold the attention of a two year old better than I can with a book in hand. I would recommend this DVD for children ages two to nine. The concepts may be hard to grasp for the younger kids, but they will get something out of it and should understand more of it as they get older. Even the youngest kids should gain something from this message. Elliff also told me of hearing reports that adults have been saved through this message. The gospel is clearly and plainly stated, I can see how God would use it to save a great many people of all ages. With the blessing of my pastor, we will show this at children’s church one Sunday morning. I highly recommend it to anyone with an opportunity to minister to young children. At the time of writing this review, the DVD is available from CCWtoday for a special pre-publication price of $6 with free shipping.